Shannon and Chip Wilson donated 8 million of their personal wealth, and Lululemon donated 4 million, to Kwantlen Polytechnic University to open a new school of design. The design program is called ‘Chip and Shannon School Of Design’. Shannon stated, ‘Our vision is for BC to become the global hub for athletic performance apparel and recreational products and the first step is to cultivate that talent‘. So lookout world! Vancouver will no longer accept the title of 3rd worst dressed city in the world! I kid, I kid! I actually really love that Chip Wilson has been injecting some of his moneys into the city and I think this program sounds really cool. 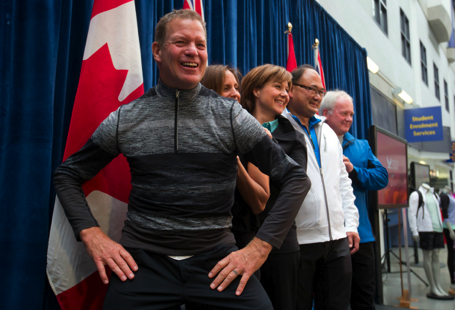 Also, Chip Wilson is wearing the new Speed 1/2 Zip in case you where wondering. Acr’teryx has made a statement on their website as they also employ a lot of past Kwantlen graduates. "Run: Bold In The Cold LS, Laceoflage and Love Red Scoop Neck Tank, St. Moritz Sweater"
"Power Purple Define Jacket on Oprah Magazine Cover"